This is an audio file of a prayer for autism and also a discussion about autistic and special needs children and their parents. To give some context, we had a five hour prayer session where the topic was not related to special needs but at the very end when we got to the praise reports someone gave testimony about an autistic 12 year old and this turned the conversation in that direction. Don’t worry we are not going to force you to listen to 5 hours! This is significant because a mother of an autistic boy contacted us just 3 days prior asking for prayer. We prayed for her and thought this was enough. However, when the Holy Spirit brought up the subject again to this prayer group it was evident that God was taking out His highlighter and highlighting this subject as something that is currently on His heart and mind. We feel He is ready to perform miracles in this area. Major breakthrough for many. We also feel that God is calling His church to be more compassionate to people – mothers, fathers, grand parents, brother and sisters – who have someone with autism or special needs in their family. The audio file is only the portion that shares the testimony, a prayer for autism and special needs and the discussion that followed on how the church should respond. It is 33 minutes long. You can listen to the prayer and discussion or you can read the transcript of only the prayer below. If you don’t have an autistic or special needs child, you should still listen to this because your response and reaction when you are around someone with special needs is important. 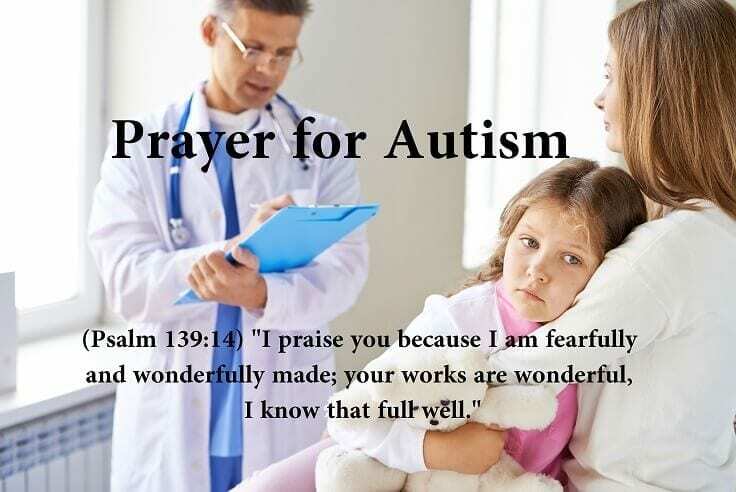 If you are a parent, family member of friend of someone with autism or other special needs please leave the information in the comments and we will pray for them. Father God, we just thank you for children who are facing autism and experiencing sensory overload. We also pray for those who have special needs, children and adults, who may have other things going on in their bodies and mind that they’re not able to control. They are in your hands and you see them, Oh God. We come against the enemy and any spirit that will want to overwhelm them, in the name of Jesus. We pray for freedom in their spirits to be who you called them to be. We pray for healing in their bodies, mind, soul and spirit. Where there’s any deficiencies that you make up the deficiency Father God that you fill them up Lord God with your healing virtue. We thank you that by Jesus’ stripes they are healed. the challenges that they are having in this world, Lord, we pray You make every crooked road straight, in the name of Jesus. We declare healing over our children with challenges. We pray Lord God that the body of Christ would accept and embrace our children the way You accept and embrace our children. Our love is truly on trial – can we love those who maybe don’t fit the framework of what we think people should be? Help us Lord God to see people as people and to love them with the heart and the compassion that Jesus Christ has for us. Father, we thank you that even that our children and adults with special needs are still be useful in the kingdom. We thank you Father God that for your word that says train up a child in the way they should go and when they are old they will not depart from it. We pray that their giftings would come forth, in the name of Jesus. We pray that the body of Christ would recognize that where there is a deficiency You make up the gap in other areas. Thank you for their superior intelligence and the true gift that they are from you – a gift to this world. Thank you, Oh God, for their enhanced ability to love us even when Your people don’t show the love of Christ towards them and acceptance towards them. Cover them Lord and shelter them from rejection and fear. Lord God, in the name of Jesus, encourage and strengthened the hearts and minds of the parents and care givers that are raising children that are having challenges, whatever they may be. Father we pray that you give them wisdom on how to raise these children that are truly a gift from God . Give them the wherewithal and whatever is needed to raise your children to bring out the best in these children so that they will be able to fulfill your purpose for their life. We ask, Lord God, that Your body will see these children with eyes of love, eyes of caring, eyes of patience and develop us in the fruit of the Spirit. Help us to examine our own fruit and prune us so that we will bear much more fruit. Father we abide, remain, habitate in your vine, in the name of Jesus Christ we pray. My son Emmanuel 5yrs old is autistic, does not speak a word, swallow food do not chew, still not proper (in pampers ) but is a happy child, he loves to have people around. Pls pray for him. I know God has a purpose for him, I need to be very patient with him. Please pray for Rachael Faith she is 6 years old autistic and doesnt have healthy eating habits, only eats pizza, chicken and doughnuts (sweets). Please pray for me as l am always worried about her being hurt or what will happen to her when l go with God. Thank you so much in advance. Please pray for my son Luke, he is 4 years old and has one of the sweetest smiles you will ever see. Unfortunately he is on the spectrum and requires your prayers ! Please pray for my 4 yr old son who has autism. He is a fun, and brilliant little boy with a sense of humor I adore. However, with everyone with someone with autism it has been a rough road for him and my family. He speaks, but 2-3 words, not full sentences, he can be impatient at times 2hich can cause huge tantrums. (Not neutotypical kid tantrums, autism/sensory tantrums and meltdowns). God has special place for this boy. This is the child, that sings What a beautiful name, Jesus, there is something about that name, it is well with my soul. He doesn’t socialize on his own too much yet. The list goes on, but regardless your prayers are so very welcomed. I need grace and balance. In all this I have lost myself. My son loves the solar syestem, and I wait for the day when we wil have conversations about space, and what he believes is out there and I will tell him mine. Please pray for my niece, she is 2.2 months old. She has been suffering from Autistic; Seizure and hypertension. She has few words. Heal her Lord, recover him from Autism. Please pray for my son Christopher Kwafo. He is 9 years old and battling autism. I have family members who are occult and has been praying against my son before he was even born. I was spiritually attacked when I was pregnant with my son. My son came out 3 months early. While in the hospital my own mother came to my house to say my son should die. I have been having dreams seeing my son in a cage. I had many dreams pointing to family members having dirty hands towards me and my son. It’s been prophesied that my mother(Akua Aboagye) and sister(Rafia Lawal) are witches and are against my life, against me getting married, or being happy in life. They are very against my son Christopher. Please pray for us. I took my son to churches but they were unkind to my son and I. Please pray also that God brings good helpers into my life, and a God ordained husband. Thank you. Thank you. I have been using your recommended prayers. Thank you so much for your prayers. God bless you and your whole family and ministry. My son Ivaan is recently diagnosed having ASD. We are much worried about his future. May the Lord of wonders heal him and save him. Jesus Christ is our only hope now. Please pray for him. Please Inlcude in your prayers my 3 year old son Lucas who has been diagnosed with ASD. We are all working for him to have his therapies and give him the normal life. Heal him Lord, recover him from Autism. Please please pray for my son who just turned 5yrs old. He talks few words, very less eye contact & has been diagnosed having ASD. We are normal family only not earning that much & can’t afford to send him for Therapies which are very expensive. Our family is thanking you in advance for the special prayer for my son – Jaeron Zaniel. Please pray for my 30 month old son. He’s not spoken a single word yet and showing a few symptoms of ASD. We are awaiting our appointments just now. Please pray for my 12 yrs old son Nicholas who is autistic and extremely aggressive physically and verbally.